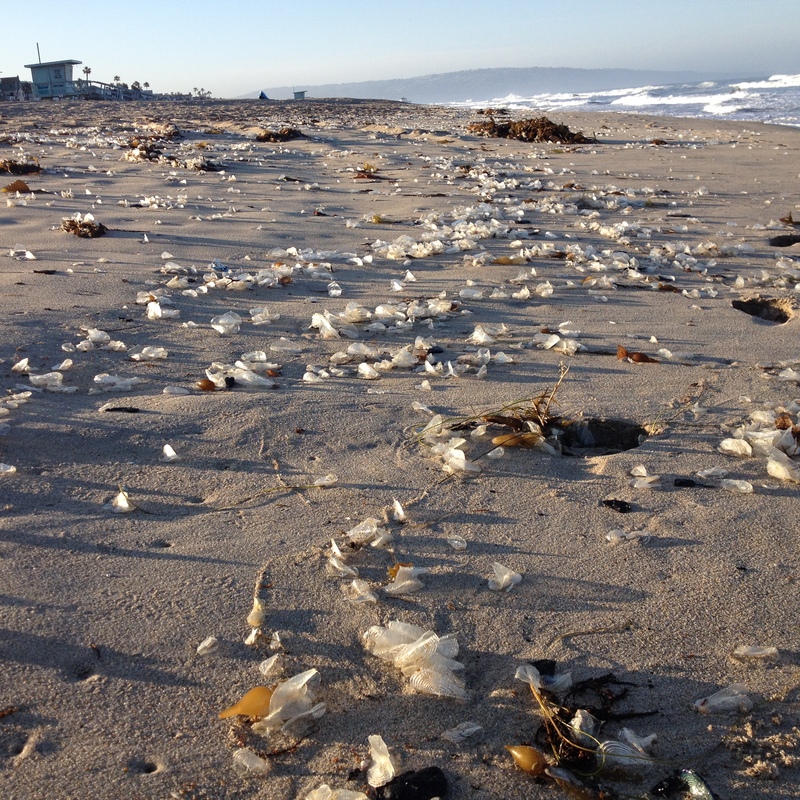 Earth Day weekend (April 25, 2015) brought a surprise to beaches along Santa Monica Bay–shoals of Velella velella, known as by-the-wind sailors, washing ashore Santa Monica Bay beaches. Alive, these small jellies are a striking blue in color, and are actually a colonial organism that may be in the same group of organisms as Physalia, the Portuguese man-o-war. Inhabiting tropical and temperate seas, they are a pelagic species sailing with the winds far from the coasts while feeding on small zooplankton and fish eggs. Velella evolved as a neuston species, one that is half in and half out of the water. Its oval disk is filled with air-filled chambers to keep it afloat, and an array of feeding and reproductive polyps along with small tentacles armed with stinging cells (harmless to humans) coat its bottom. The most obvious feature of Velella is the semicircular sail set at about a 45° angle to its oval body. Populations with their sails set to the left (northwest to southeast) will angle to the left with the wind, while those whose sails are set to the right will travel to the right of the wind. Along the West Coast, individuals typically have their sails set NW-SE, so as they reproduce and grow far to sea, they will move towards the West Coast (Ricketts and Calvin, 1968). Depending on winds and currents, they can blow ashore in enormous numbers, blanketing beaches along the West Coast with their blue bodies. The Encyclopedia of Life is a good source of information about this species (http://eol.org/pages/1006207/details). The stranding event that occurred this past week is unusual in that the jellies were dead before being washed up to the beach. All that remained were the cellophane-like floats with their stiff sails. 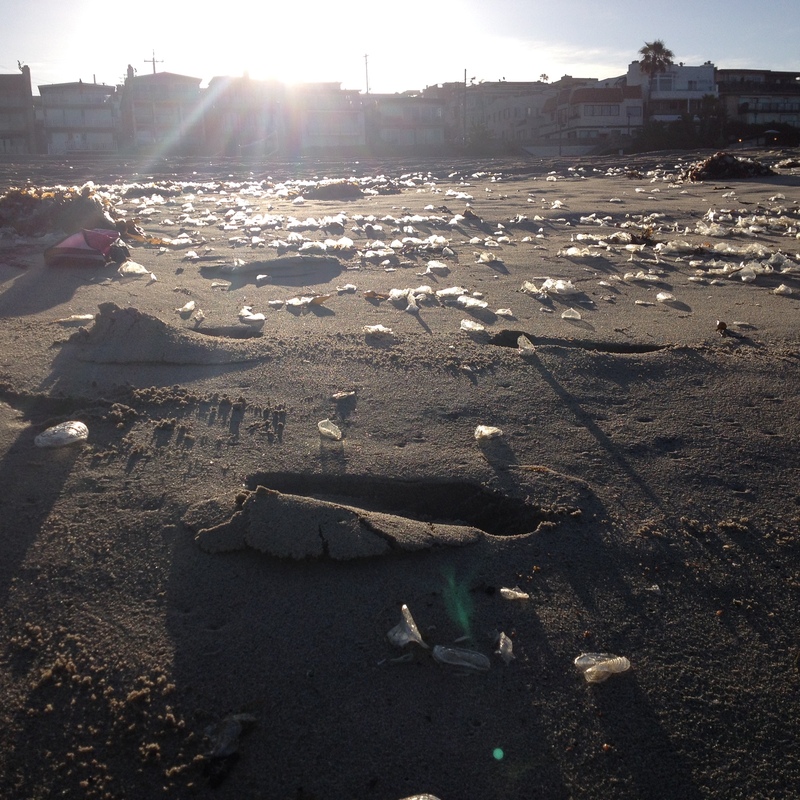 The beach looked like it was littered with oval pieces of plastic! Of the horde, there were a few individuals that were alive when cast ashore, but these were only about a third of the size of the dead individuals. By-the-wind-sailors cast ashore at El Porto, Manhattan Beach, April 26, 2015. Miles of Santa Monica Bay beaches were covered during this event. A living By-the-wind-sailor wash up during a mass stranding earlier in the year. The cast of a dead individual cast ashore during the April 26th event. Why were these individuals dead with only their tough disks washing up on our beaches? Were they killed by some toxic event, or reached the end of their life cycle? There may be a simpler explanation—they may have been flipped by the wind. Rafts of Velella chug along happily in winds up to 20-25 mph, but with greater wind speeds, they are in danger of capsizing. 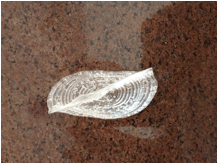 During gale winds of 38-46 mph, the sea surface would be rough with large, wind-blown waves—ample conditions to capsize shoals of Velella. If this happens, it’s all over for the colonies since they lack the appropriate muscles to right themselves. When upside down, their delicate polyps, tentacles and supporting tissues are exposed to the sun, and within hours they begin to undergo degenerative processes (Francis, 1991). By the time they are blown ashore, all that would remain would be the cellophane-like cast. Earlier in the week strong gale-force northwesterly winds were blowing along the outer waters of the southern California Bight, seaward of the Channel Islands, with gusts of 40 mph or greater. These winds probably were powerful enough to capsize huge shoals of Velella, pushing them to shore as the winds backed to westerly and onshore nearer to the coast. 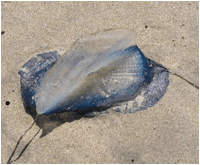 On Monday, April 27th, piles of white Velella casts still extended all along the high tide mark, but now blue individuals began dotting the shore—they were alive when wash up overnight. Offshore gale-force winds had abated over the weekend, so maybe this event of “flipped over sailors” is past. All this is just a hypothesis, but seems to be a simple explanation and needs to be tested. The sea always offers countless questions to ponder! I like that this event happened during Earth week. The ocean always has wonderful surprises to experience, and we all need to strive in any way we can to keep it healthy. Do your part to protect our ocean, wander the beaches, and enjoy! Francis, Lisbeth, 1991. Sailing downwind: Aerodynamic performance of the Velella sail. Journal of Experimental Biology, 158: 117-132. Ricketts, Edward F. and Jack Calvin, 1968. Between Pacific Tides. 4th Edition, Revised by Joel Hedgpeth. Stanford University Press, Stanford, California.